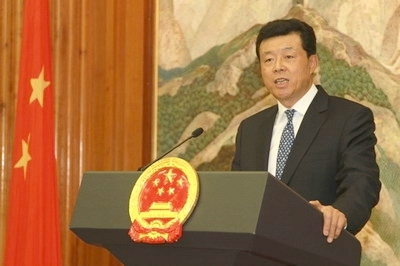 On 21st June 2011, Ambassador Liu Xiaoming held a press briefing at the Chinese Embassy in the UK on Premier Wen Jiabao's upcoming visit to the UK. Present were more than 30 journalists from 21 Chinese media orgnisations, including People's Daily, Xinhua News Agency, CCTV, China Radio International, China News Service, China Daily, Guangming Daily, Economic Daily, Ta Kung Pao, Phoenix TV, Sing Tao Daily, Hong Kong TVB, the Financial Times, the Times, BBC, the Independent, Thomson Reuters, the Associated Press, Dow Jones News and Bloomberg. Ambassador Liu said that at the invitation of Prime Minister David Cameron, Premier Wen Jiabao of the State Council of China will pay an official visit to the UK from 25th to 27th of June. The UK is now China's third largest EU trading partner. Britain is the second largest EU investor in China. In turn the UK is a major destination of Chinese investment overseas. China is the UK's second largest trading partner outside the EU. Chinese statistics point to a China-UK trade in goods of 50.08 billion US dollars in 2010. China is also the UK's 10th largest export destination and third largest source of imports. Last year saw a year-on-year increase of 40.9% in the UK's export to China; that is the fastest growth among Britain's top 15 export destinations. China-UK trade has maintained this fast growth since the beginning of this year. During 2011 the trade volume was 20.97 billion US dollars for the first five months or a year-on-year increase of 17.4%. By the end of April this year, the UK had invested in a total of 6,830 projects in China, with paid-in investment of 17.4 billion US dollars. In turn, China had a direct investment of 1.25 billion US dollars in the UK. China has risen to be the UK's 6th largest investor in terms of number of projects, and ranks the second in London in terms of number of investing companies. Chinese and British relations are also marked by a strengthening scientific, educational and cultural cooperation – the UK now stands as China's number one research partner in the EU; Britain attracts more students from China than any other EU country; there are nearly 120 thousand Chinese students studying in the UK; across Britain there are 13 Confucius Institutes and 54 Confucius Classrooms, more than any other country in the EU. Ambassador Liu pointed out this visit will be the first by a Chinese Premier to the UK since the coalition government was in place. The meetings will provide another important top level exchange between our two countries following Prime Minster David Cameron's visit to China last November. The dialogue will build on the exchanges held during Vice Premier Li Keqiang's visit to the UK this January. It is expected that the meetings in London this June between Premiers Wen and Cameron will set the shape and direction of China-UK relations in the months and years to come. Ambassador Liu said that the two Premiers' meeting has the following aims: in-depth exchange of views on China-UK relations and dialogue on major international and regional issues of mutual interest. In addition the two Premiers will witness the signing of government agreements and business contracts spanning from energy to transport and infrastructure. He was glad to report that the drafting of the relevant documents are well underway. Premier Wen will deliver an important speech during his stay in London. Also Premier Wen will go to Birmingham to visit the MG Motor business and attend the launch of the new model MG6 Magnette. The MG Motor UK Ltd is a fully Chinese funded subsidiary of the Shanghai Automotive Industry Corporation after its acquisition of the MG Group. The MG6 cars are the latest example of how China and the UK work together for mutual gain. The cars are designed in the UK, made in China and assembled in the UK. Ambassador Liu expressed the hope that this visit to the UK by Premier Wen Jiabao will serve two purposes. Firstly, promote practical cooperation. China and the UK share similar ideas about development. Both are restructuring their economies. Each country is trying to evolve improved forms of governance so as to serve their peoples better. Through this continual dialogue China and Britain can benefit by the exchange of experience and so learn from each other. There is great potential to be gained from learning from each other and cooperating. There are many examples to provide a guide: with infrastructure, high-end manufacturing, financial services, green and low-carbon industries, energy efficiency and environmental protection. We should also explore new areas of cooperation. Within the United Nations China and Britain have big responsibilities over peace and stability of the world as two of the five permanent members of the UN Security Council. China and the UK should maintain close dialogue and coordination on major international and regional issues. Secondly, increase mutual understanding. It is essential to be realistic that China and UK dialogue and relations will face many challenges. The realism is needed given our differences in social systems, historical and cultural heritage. We also have greatly different levels of development. Ambassador Liu pointed out that the international political landscape is undergoing profound changes. The global economy remains volatile. This makes it all the more important for China and Britain to deepen understanding. There is a powerful mutual interest for China and the UK to dialogue as they are two important countries in the world. The two countries share many common interests so it is therefore all the more important for us to work together. This visit to the UK by Premier Wen Jiabao provides China and Britain an important opportunity for us to take our relationship forward. Both the Chinese and British governments are working hard to ensure that Premier Wen's visit to the UK will be a success. I believe the preparations being made will boost mutual understanding and trust between China and the UK. The plans being formulated will facilitate fresh exchanges and cooperation. The result will be to bring our relations to a new level, to the benefit of all our peoples and humanity right around the world. First, an opportunity for growth. China is implementing its 12th Five-Year Plan while the UK has formulated a development strategy for the medium to long term. Both China and Britain share similar ideas about development, and our cooperation holds out great promise given our complementary strengths. Second, an opportunity for a harmonious society. China takes improving people's livelihood as the ultimate objective of upgrading its growth model. It is exploring a new way of governance. The UK is pressing ahead with a public services reform. It serves our best interests if we exchange ideas about governance issues on a regular basis. Third, an opportunity for mutual understanding. There are many indicators that increasing numbers of people in China and the UK are showing a keener interest in knowing more about each other. The London Olympic Games and the arrival of two giant pandas will build new platforms for China-UK sports, cultural and educational exchanges. Fourth, an opportunity to improve international governance. Both China and the UK are working to play a more active and constructive role in major global issues. Examples of these major matters are reform of the international financial system, world trade negotiations, climate change, counter-terrorism, non-proliferation and trans-national crimes. By doing so, both China and Britain hope to facilitate the building of a more reasonable and effective mechanism for global governance. First, we need to respect one another. China and the UK sometimes see things and approach issues in different ways as a result of our differences in historical and cultural heritage, level of development and political system. Respect for differences is the first step towards an equal dialogue. It is also a must for building understanding and confidence. We need to be open-minded, abandon the Cold War mentality and avoid imposing on others. Only in this way can we solidify the comprehensive strategic partnership and ensure a smooth and sound relationship. Second, we need to increase mutual understanding. There is an imbalance in knowledge and information between us and the deficit is clearly on the UK side. Many Chinese children, for example, start learning English at kindergarten, and most Chinese people know about Shakespeare and Newton. But people in this country do not have the same level of knowledge about China, in particular contemporary China. It is hard to find books about today's China in British bookstores. Many British friends told us how amazed they were at how open, inclusive and dynamic China is only when they visit China. It is through you, friends from the press that the general public in this country learn about China. So I do hope that you will report China in even more comprehensive and objective ways and help the British people know more about my country. Third, we need to build trust. Mutual trust and cooperation are indispensable to each other and mutually reinforcing. Confidence-building is the only way to retain the vitality of our comprehensive strategic partnership. We are ready to work with our British partners to fully capitalize on the existing dialogue mechanisms at all levels to deepen exchanges, enhance mutual trust, respect and accommodate the other's concerns, handle differences properly and create an environment and conditions conducive to win-win cooperation. When asked about how he sees the prospects of China-UK relations, Ambassador Liu used a car analogy and outlined four key "driving points" to develop China-UK relations: One, pay attention to the right direction. China and the UK need to stay committed to a comprehensive, strategic and cooperative partnership. Two, make sure there is enough horsepower. We need to hit the accelerator and facilitate simultaneous growth of both the quantity and quality of our cooperation. Three, make sure the car is robust to underpin a stable performance. China and the UK can only overcome difficulties and challenges and maintain a stable relationship by building political mutual trust. In all our dialogue we must always treat each other as equals and respect each other. Fourth, take care to check the condition of the road. State-to-state relations boil down to amity between their peoples. China-UK relations need a fast and smooth road, or an environment conducive to cooperation. This will be achieved through extensive people-to-people and cultural exchanges. Exchanges between our young people are in particular a high priority. In turn this will secure more popular support for the relationship and foster positive public opinion. To answer the question by James Kynge of the Financial Times about whether Premier Wen will announce further measures to support countries in the euro zone during this visit, Ambassador Liu said that Europe is China's important economic partner. China follows the economic situation in Europe with close interest, and China has a stake in whether Europe is able to weather the difficulties and emerge from the economic downturn. China did not sell any of its euro assets during the debt crisis, and instead lent a helping hand to Greece, Spain, Portugal and Italy. China is a staunch supporter of the euro zone-IMF assistance plan for Greece and others, and it will be a long-term, responsible and active investor in euro and the European market. Ambassador Liu also answered questions about on the British side could improve the investment environment for Chinese businesses, prospects of China-UK cooperation in high speed railway, cybersecurity and situation in Libya and Syria.